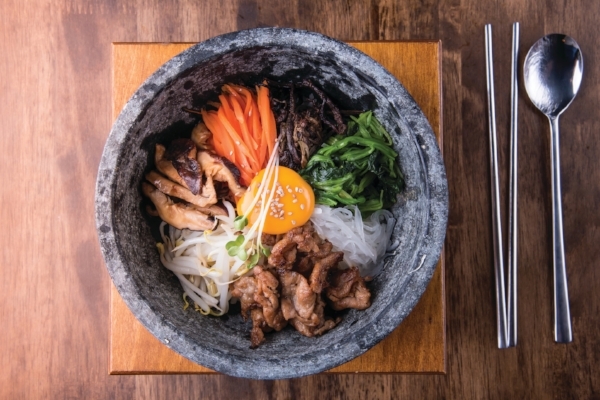 Bibimbap is just one of many dishes that can be found in restaurants along Howard County’s Korean Way. Korean food fans, you are in luck as the Korean Way features solid options for Korean barbecue, bakeries and a new HMart that opened in 2014. Having traveled along the Korean Way myself as a culinary explorer, some personal favorites are Shin Chon Garden for barbecue, Tous Le Jours and Shilla for Korean baked goods and, of course, Asian market superstores Hmart and Lotte Plaza for all things Asian. Both markets provide great shopping experiences for the food curious and an absolute guarantee you will bring home something exciting that you’ve never heard of or planned to buy. In fact, Hmart gets its name from “Han Ah Reum,” which means mean “One Arm Full of Groceries,” just as you will be when you leave. Korean chains are represented: Bonchon fried chicken, Kung Fu Tea and Honey Pig all have outposts on Korean Way. Beyond bubble tea and bulgogi, you’ll also find a trendy Korean skin care product shop on Korean Way. For those not in the know, South Koreans are considered global leaders and innovators in all things skin care, and The Face Shop, known for having high-quality, affordable goods, features Korean-made skin care products made from over 600 natural ingredients: fruits, grains, flowers and medicinal herbs used in Asian medicine.